Jerusalem, Israel—October 30, 2018. Ex Libris®, a ProQuest company, is pleased to announce that campusM Attendance module is now available to all development partners. This first release represents an important phase in the development of a feature intended to facilitate class attendance tracking for institutions of higher education across the globe. The outcome of pilot programs and close collaboration with academic institutions, campusM Attendance is currently being implemented at development-partner sites. Using the device of their choice, students at these sites can check in to lectures through the institution’s mobile app or desktop portal. 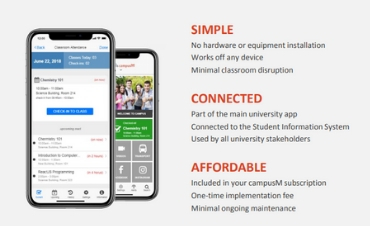 The app reminds students of when they need to attend a class via personalized push notifications and displays their attendance record on the Check-in History screen, all on their handheld device. Being able to easily collect and analyze student attendance data is a key component to our student engagement strategy. As with all Ex Libris solutions, the features for this release were defined in collaboration with development partners in the United Kingdom—Lancaster University, the University of Exeter, and the University of Plymouth—and the University of Montana in the United States. 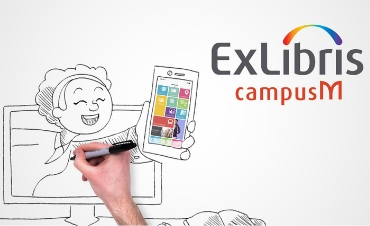 The development partners’ in-depth feedback through ongoing conversations, along with their experience using the current campusM release and previous versions, will assist Ex Libris in improving and streamlining the full set of processes and workflows in campusM Attendance. To learn more, visit the campusM Attendance web page.